Featured in the film Notting Hill, the Duke of Wellington serves an excellent choice of drinks including craft beers, fine wines and cocktails. The food menu at the Duke of Wellington offers classic British dishes, small plates and bar snacks. What did you think of The Duke of Wellington? The Duke of Wellington is a good place to relax. It's not too pretentious given the area, but the staff do try very hard to be all Richard Curtis at you. I like the food and the atmosphere is chilled. Would recommend The Duke of Wellington to people whol like to read the papers over a pint of a Saturday lunchtime. The Duke of Wellington is a haunt of dumb yuppies with nothing to say. Luckily they do do appear to drink much since the bar is clear, but this could be due to a lack of barstools. The worst Youngs Special I have ever encountered. The promise of a Bohemian atmosphere for which this pub was worldly famous has evaporated. If I could I would give it less than one point due to disappointment and disgust. Wow what can I say. This pub has had a sparkle and new landlord and is amazing now. No the same pub it used to be! We eat in the new upstairs dining room - Finch's. The food could not be faulted, it was a traditional British menu with a modern twist. Everything is freshly prepared and there are specials on everyday- I had the whole roasted seabass which at £15 was very reasonably priced. Great selection of craft beer and ale - we had the Youngs Special and Youngs Gold. Both were in excellent condition Well worth a visit now - you will not be disappointed. I am truely shocked at this place. I booked a table for my birthday party and a Sunday roast. When I called on Sunday they said there was no such booking and not only that but they spoke to me over the phone like I had done something wrong and didn't even try to find me another table. They Basicly just told me there is no space! I am truely shocked at the lack of customer service and lack of professionalism. I advise stay clear away they don't deserve clients! Well,all I can say is avoid this overcrowded expensive place. We went there for roast dinner today and could not be more disappointed. To start with, I paid 4.45 for a pint of Heineken.A lot ,even for London. Food we ordered arrived after 30-35 mins.I wouldn't mind if it was worth it but unfortunatelly it was not.Roast dinner I got was really bad. Veggies were overcooked,mushy and cold for some reason. Roasted potatoes were burnt and tough.Gravy wasn't good either. All this cost me 12.95 so please don't be fooled to go there.It seems that person who cooks in their kitchen is a guy just desperate for any job rather than a professional chef. Pointless to complain to waitress as she speaks very little English. I got a pint of Cider there for 4,30. This is expensive, even for London. But the worst thing is that my bag was stolen there. I was not even very careless but still not careful enough. When I told the waitress, she commented that they have things stolen there all the time. Why didn't they put a sign to inform people to be super careful? Apparently they do not want to put off customers... The pub is obviously frequented by professional pickpockets. Two CCTV cameras pointed at our table but it did not put the thieves off. Apparently they know that the quality of the footage is really bad. Bottom line: expensive, no warning and not even providing real help by CCTV footage that is actually useful for the police. If you want to relax and have a good time without being suspicious of anyone around you, I would not recommend going there. if the staff are overworked then maybe the company should employ some more. whilst they are at it they could ditch the microwave and get in a chef to cook real meals. possibly the worst food i have eaten since i accidently poisoned myself by not cooking rhubarb correctly. had gammon egg and chips. meal had been warmed up and chips appeared to have been fried continuously as for the egg it would have passed if id requested cold and scrambled. on complaining that it wasnt edible i was told that no other customers were complaining and therefore i could have another meal. as my wife and brother had ordered different dishes and come to the same conclusion we declined. no refund was given. this place is obviously a tourist trap and although the pub decor is quite nice i would advise to eat elsewhere. This is the best pub I’ve ever been to since I arrived in London last year! Located on Portobello road, the area is just awesome! They make really good burgers, for really cheap! I went there with my friends, we started chatting and we quickly noticed two or three hours had already passed! You just feel home! There are even very comfortable sofas if you feel tired! And there are three poker tables if you are a poker fan! By far the best pub on Portobello Rd, the staffs are always excellent, friendly & pleasing to the eye too. I had a dinner at the Duke of Wellington last night and I was amazed by the whole package, great food and excellent service & beautiful looking pub, I will definitely be coming back! The Duke of Wellington has an eclectic ambiance infused with a contemporary touch on the past. The enthusiasm of the staff makes this a pleasant place to stop off for a drink or two. On the whole, this is one of the better pubs on Portobello Rd and is one not to miss. No atmosphere, rude landlord and staff, long waits for service, suspect taste to Youngs Special, short measures; all available from an inept pub. Indeed they only appear to want to serve microscopic overpriced and mainly microwaved meals. What an advert for John Young! After a fancy re-fit, this Portobello Road pub is every bit as chic as the Notting Hill postcode would suggest. 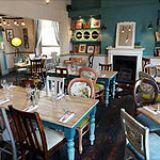 A fitting gastro pub menu and some excellent ales from the Young’s pub stable make this a destination for the fancy footfall the area attracts. Just by Portobello Road Market, The Duke of Wellington has had a shabby chic uplift to suit its environ. 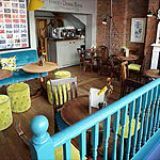 The pub has plenty of old-fashioned nooks and crannies that make for snug spaces to sit around the island bar and the décor is a blend of modern, bold turquoise and light oak wood, which pleasantly meets old-fashioned parlour dividers and an etched ceiling. Tucked away up the stairs you’ll find Finch’s Dining Room, which is overloaded with twee embellishments, be that floral upholstered chairs, calligraphy writing on the wall or draped curtains. On evenings when the lights are low there’s a charmingly moody ambience given to such a light and bright daytime venue, showing that the pub’s décor isn’t as twee as initially thought. Couples happily settle into a quiet corner while groups of older Notting Hill residents cluster around the bar at available tables guffawing and bellowing as the ales slip down. Service is so relaxed that you may be kept waiting quite some time at the bar or completely forgotten about, which probably isn’t what you’d expect from an establishment in the area. 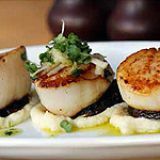 Nevertheless, they run a very tight ship in Finch’s Dining Room, with courteous waiting staff on hand to offer up menu suggestions but knowing when to leave customers to it. It’s a shame it doesn’t fill up quite so much upstairs, but the dining room is hidden away somewhat, more of a destination for those in the know. A gastro pub menu makes a few nods to modern London dining trends – see the small plates for starters – but also keeps things traditional. There’s no finer example than a small plate of potted beef cheeks with mini Yorkshire puddings (£6), a contemporary twist on a Great British classic. They are cooked in a Meantime pale ale jelly and spicy Horseradish cream, but the meat is disappointingly dry. A roasted bone marrow option (£5) is far more enjoyable, a large, halved bone with its marrow filling served sizzling to the table and accompanied with a moreish onion chutney and sourdough toast. Main courses are more of the gastro pub classics done well – pork belly (£13.50) is twice cooked to give a crispy skin and is offset perfectly with apple sauce and a sweet caramelised red cabbage accompaniment, and a wedge of fondant potato completes the dish. And a house favourite as advertised on the menu is the venison burger, a rich and gamey patty that is cooked so it’s still moist and tender in the middle. Blue cheese on top is divine, but a rasher of bacon isn’t needed in this already rich mound of poshed-up dude food. The dessert menu is equally appetising and satisfyingly trendy too – you only have to look at the salted caramel ice cream that accompanies the pear tart tatin (£6) to know that. The bar downstairs is beautifully stocked with spirits, including the finest gins from Sipsmith as well as local distiller Portobello Road. As a Young’s pub, beer is never an after-thought despite the pub’s gastro lean. The Duke of Wellington stocks the full Young’s range on draught as well as Portobello Star, Camden Hells lager and a few options from Meantime brewery, with Meantime London Lager at £4.74 a pint. Wines are well considered for enjoyment in the upstairs restaurant. Bar staff recommend a Rioja from producer El Coto (£20.25), which has depth and fruitiness that well suits the hearty British pub grub. But whites are just as geared towards food-matching, with a New Zealand Sauvignon Blanc (£25.80) and Chenin Blanc from South Africa (£17.90) showing the pub’s slight preference to New World tipples. 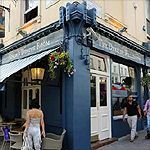 A few careful tweaks to a solid menu and a bit more pace from behind the bar, and The Duke of Wellington could be a star attraction on the already famous Portobello Road.